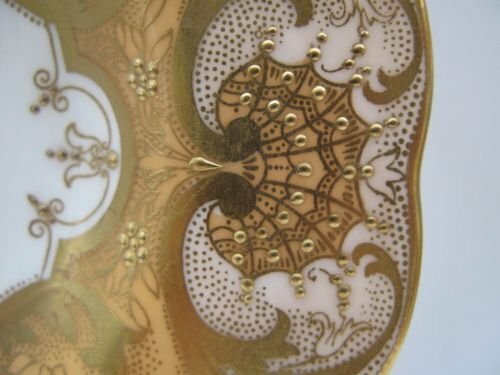 A Royal Worcester Fruit Painted Side Plate By J. Smith Circa 1970. 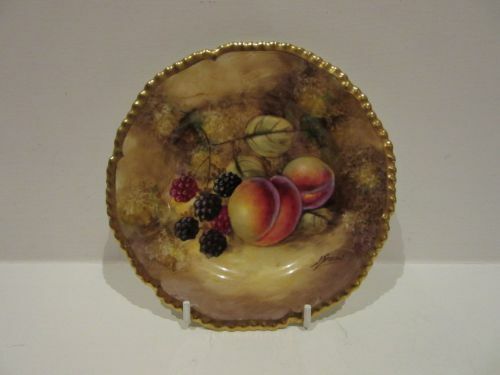 An attractive, Royal Worcester porcelain side plate with heavily gilded gadrooned rim, and painted fruit decoration by John Smith. Measuring approximately 6"diameter x 5/8"deep, it has the black factory stamp for circa 1970 and is in excellent condition with no damage, crazing or restoration and the gilding is bright and virtually without wear. 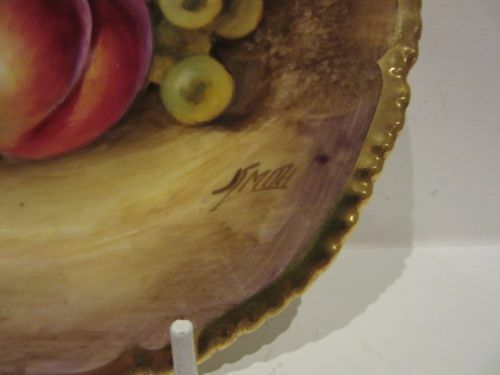 Measuring approximately 6" diameter x 5/8"deep, it has the black factory stamp for circa 1970 and is in excellent condition with no damage, crazing or restoration and the gilding is bright and virtually without wear. 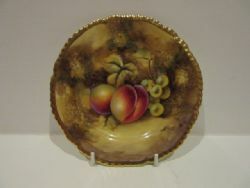 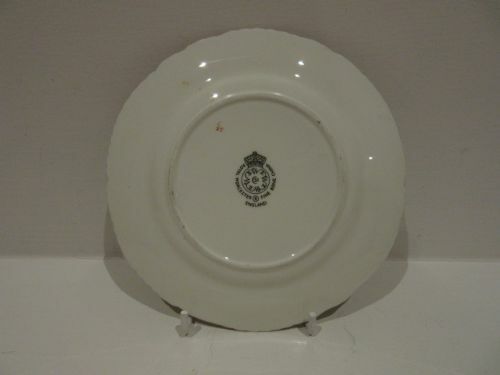 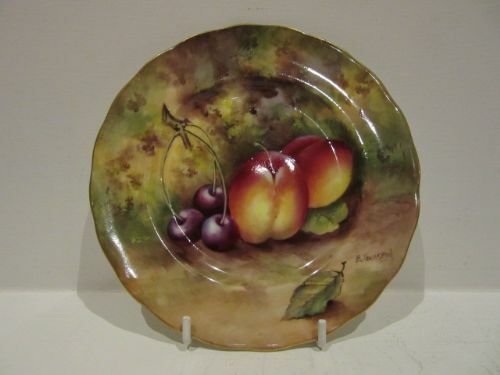 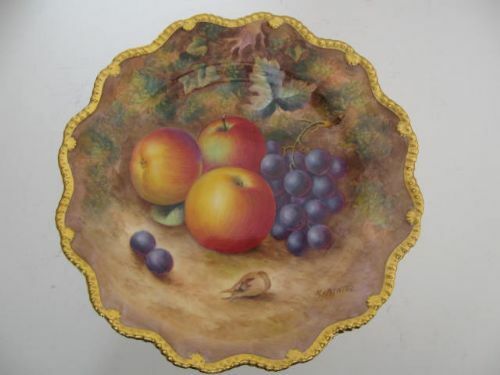 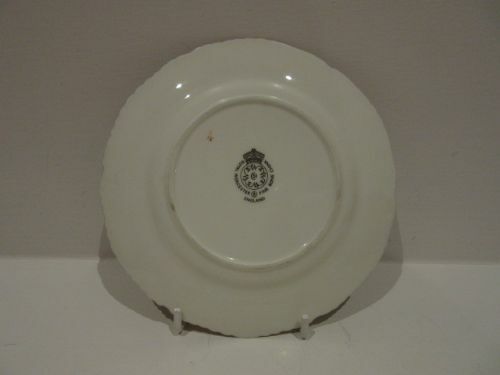 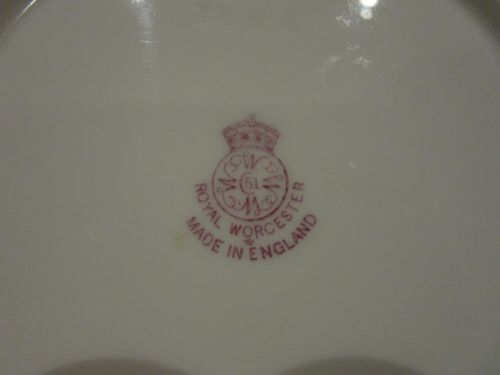 A Royal Worcester Fruit Painted Side Plate By Smith. 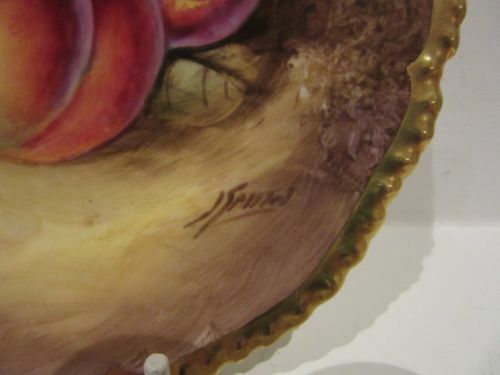 A Royal Worcester porcelain side plate, with fruit painted decoration by John Smith. 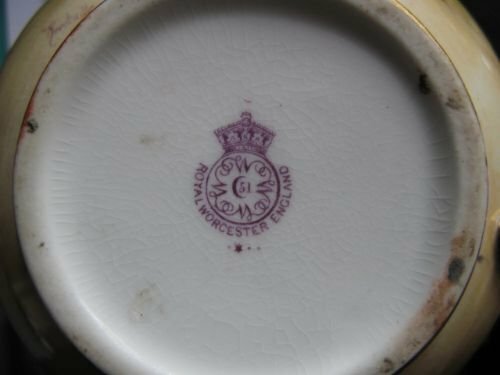 Measuring approximately 6.1/8"diameter, it has the black factory stamp for circa 1970 and is in excellent condition with no damage, crazing or restoration and the gilding is bright and virtually without wear. 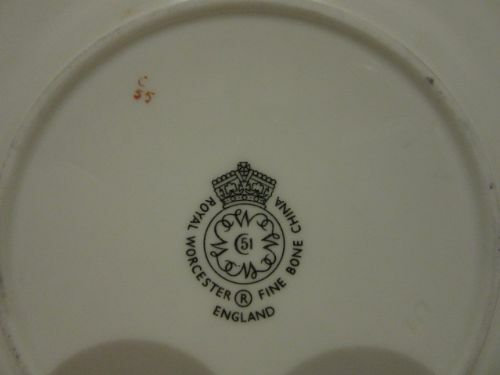 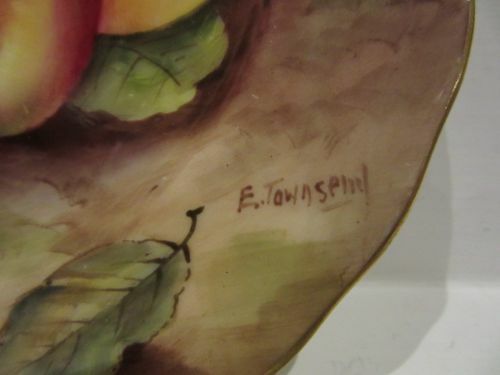 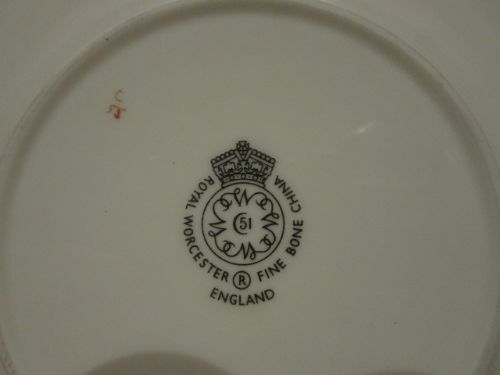 A Royal Worcester Fruit Painted Side Plate By Townsend. 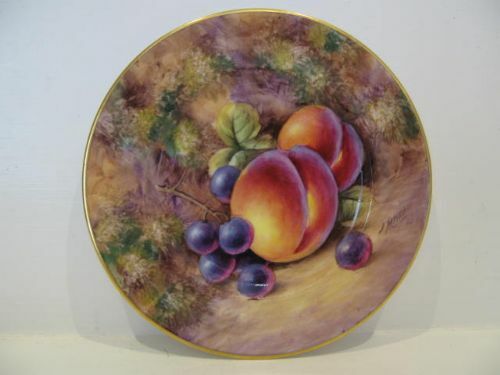 A good Royal Worcester porcelain side plate, with well painted plums and black cherries against a mossy background by Edward Townsend. 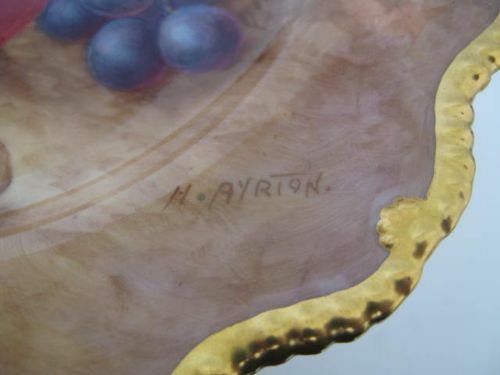 Measuring approximately 6.3/8"diameter by 5/8"deep, it has the puce factory stamp for 1930 and is in excellent condition with no damage, crazing or restoration and the gilding is virtually without wear. 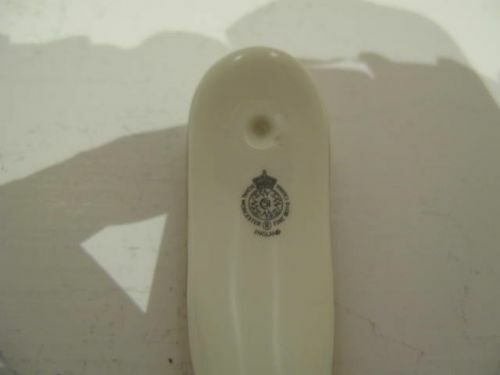 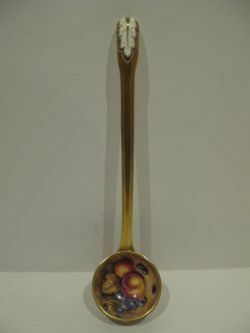 A Royal Worcester Fruit Painted Soup Ladle By P Stanley. 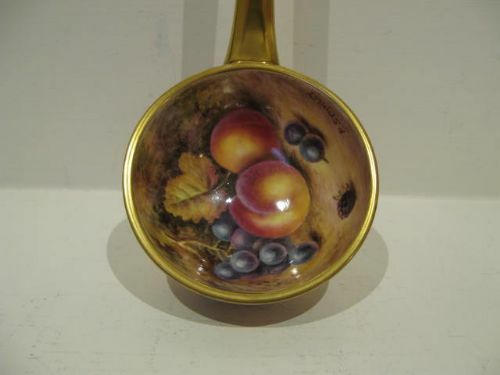 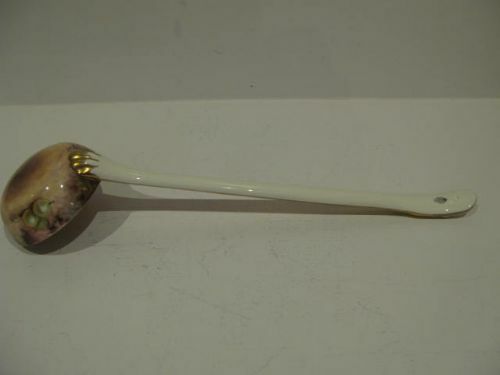 A rare, Royal Worcester porcelain fruit ladle, with well painted fruit decoration by Paul Stanley. 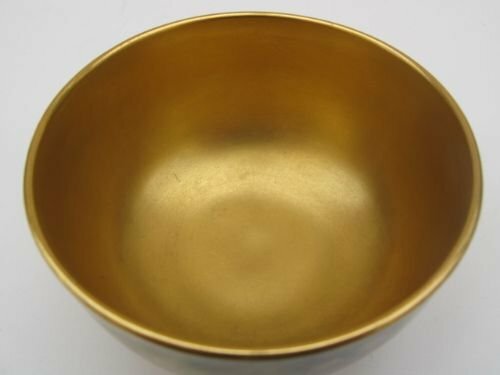 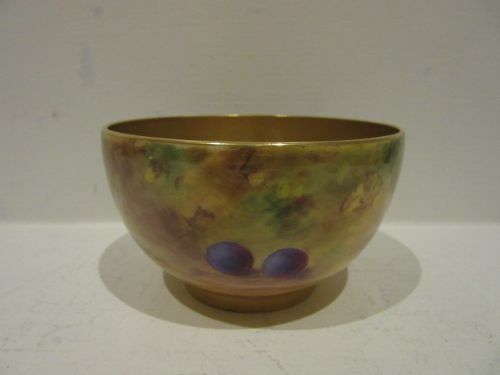 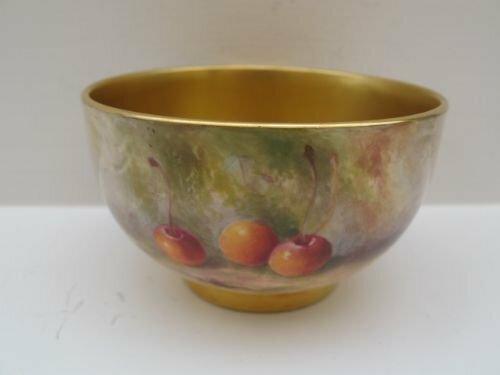 Measuring approximately 13.1/2"long x 3.3/8"bowl diameter, it has the black factory stamp for circa 1975/80 and is in excellent condition with no damage, crazing or restoration and the gilding is bright and without wear. 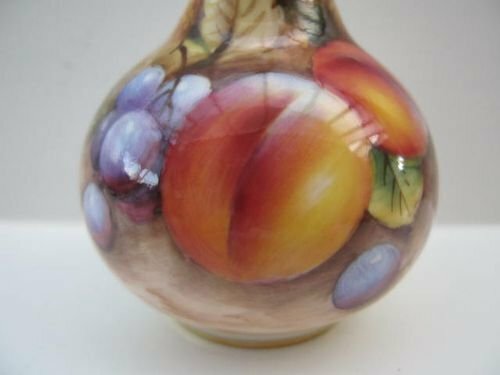 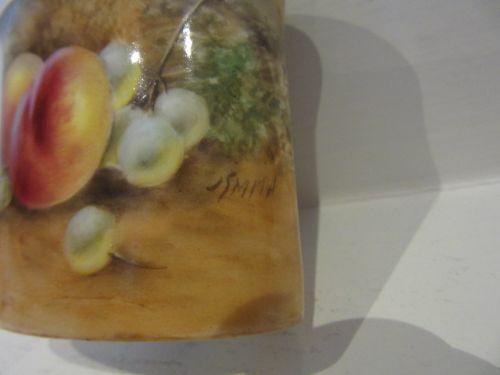 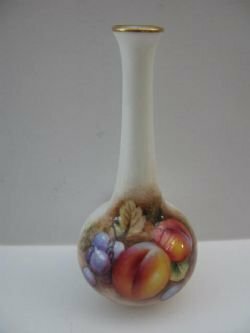 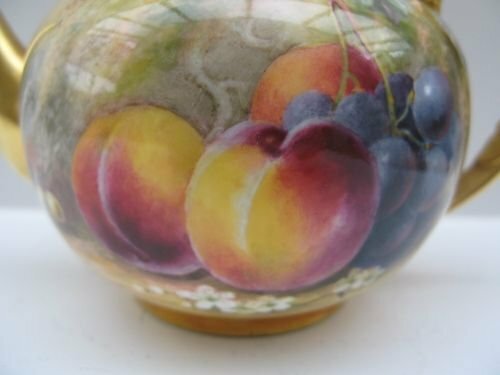 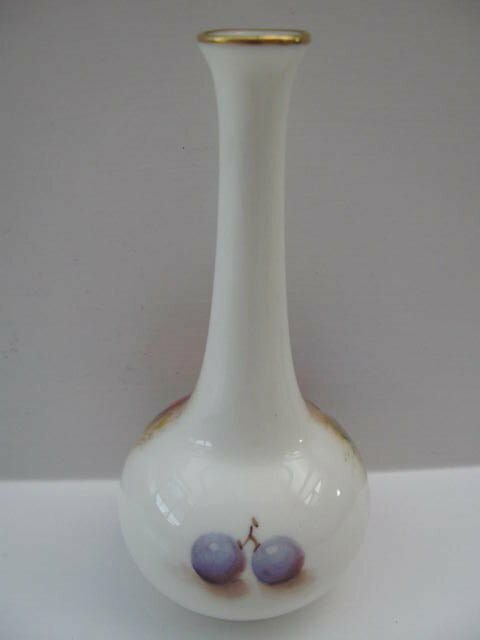 A Royal Worcester Fruit Painted Specimen/Bud Vase by Roberts. A Royal Worcester porcelain specimen/bud vase, shape number 2491, with fruit painted decoration by William Roberts. 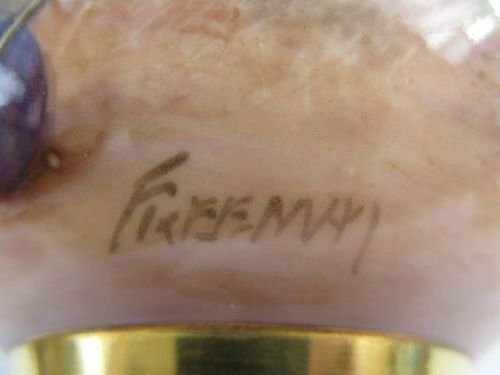 Standing approximately 5.1/4"high x 2.1/2"maximum diameter, it has the black factory stamp for 1960 and is in excellent condition with no damage, crazing or restoration, and the gilding is fresh and unworn. A Royal Worcester Fruit Painted Sugar Bowl By A. Shuck. 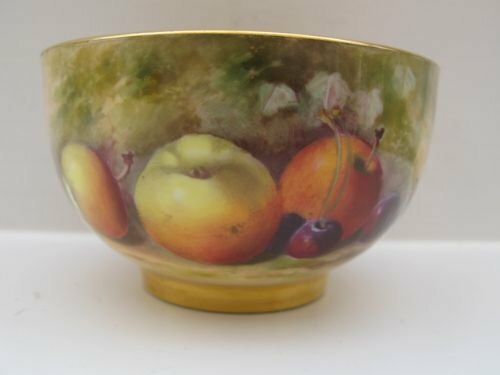 A Royal Worcester porcelain sugar bowl, decorated with well painted pears and cherries against a mossy background by Albert Shuck. 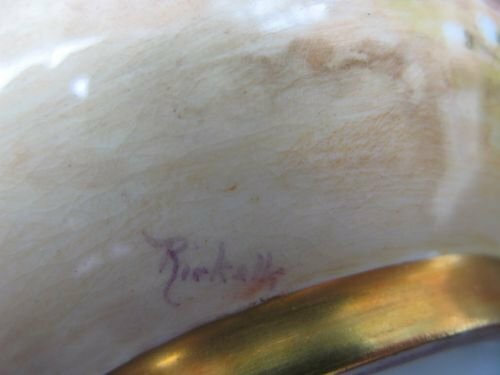 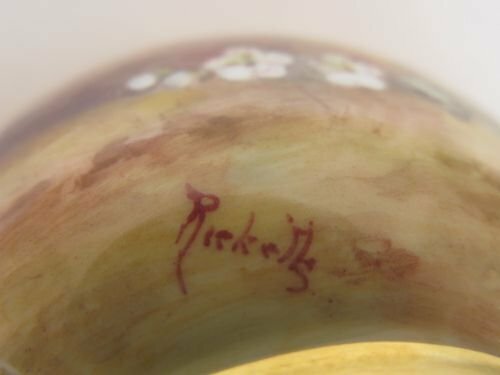 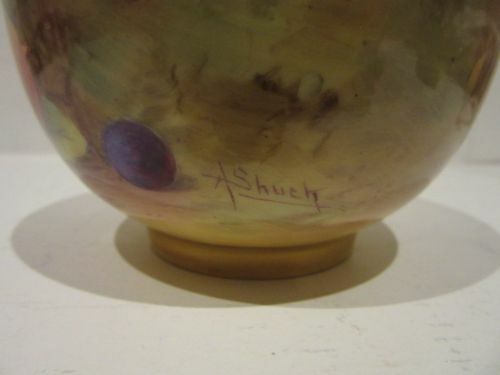 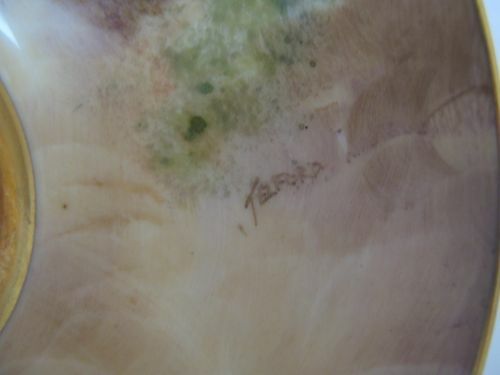 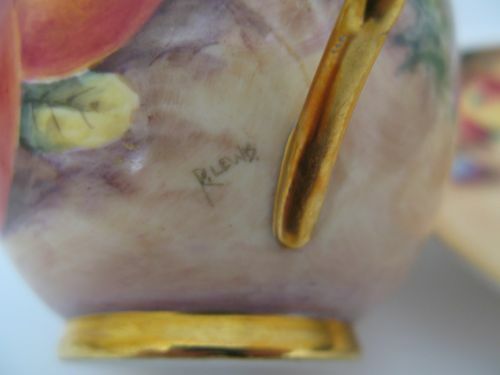 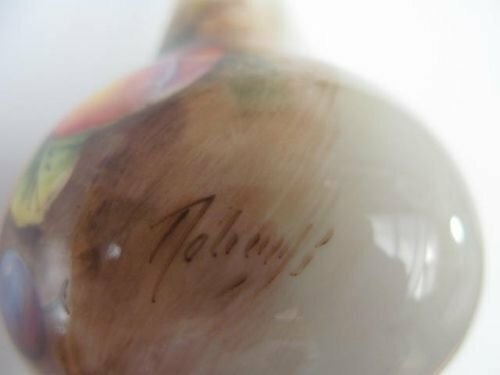 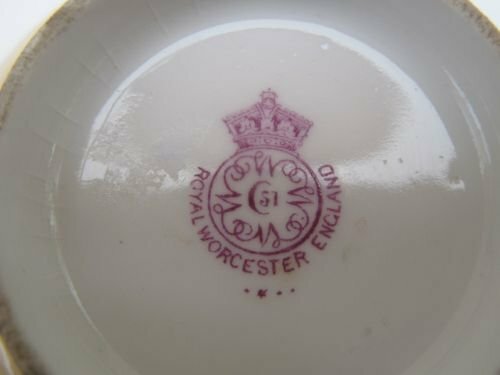 Measuring approximately 3.5/8"diameter x 2.1/8"deep, it has the puce factory stamp for 1930 and is in good condition with no damage, crazing or restoration, with the gilding showing some scuffing and minor scratching to the interior of the bowl as is usual, but no losses. 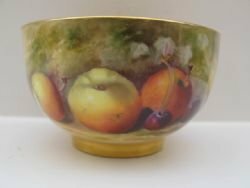 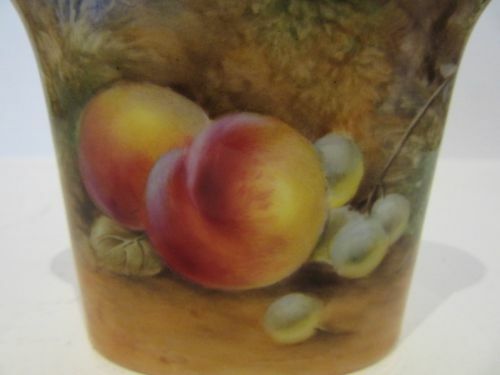 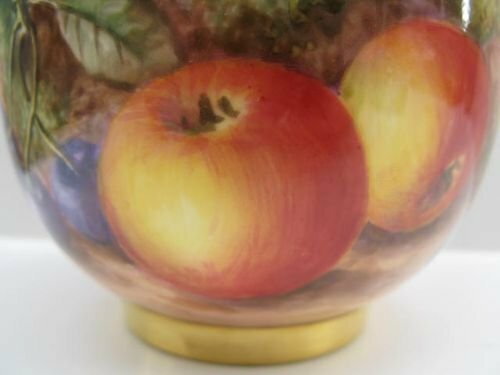 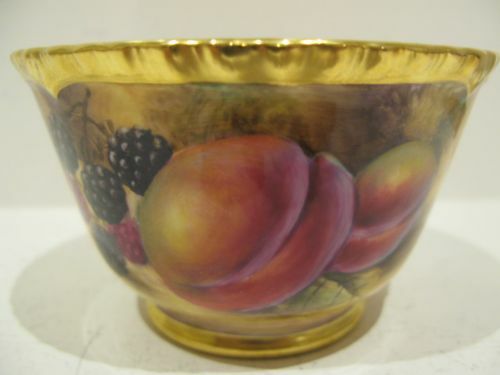 A Royal Worcester Fruit Painted Sugar Bowl By J. Freeman. 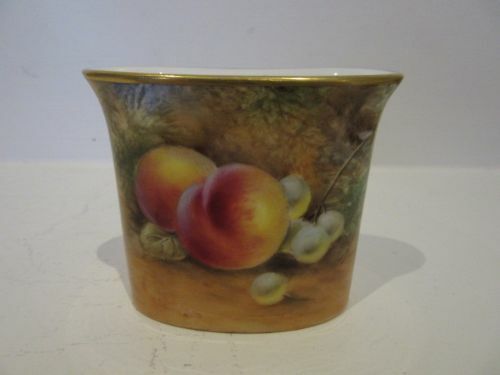 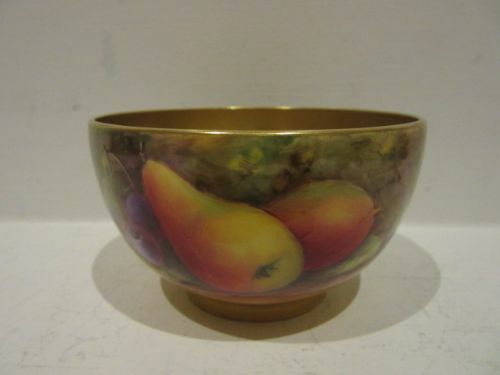 A good, Royal Worcester sugar bowl, with well painted fruit decoration by John Freeman. 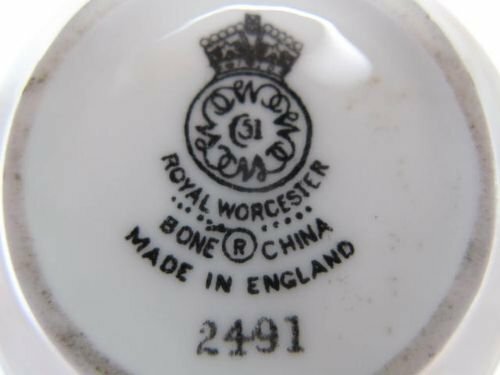 It stands 2.3/4" high x 4.1/4" diameter with the black factory stamp for 1959, and is in excellent condition with no damage, crazing or restoration, and the gilding in lovely condition. A Royal Worcester Fruit Painted Sugar Bowl By J. Smith. A good Royal Worcester porcelain sugar bowl, with heavily gilded ropetwist edge and painted fruit decoration by John Smith. 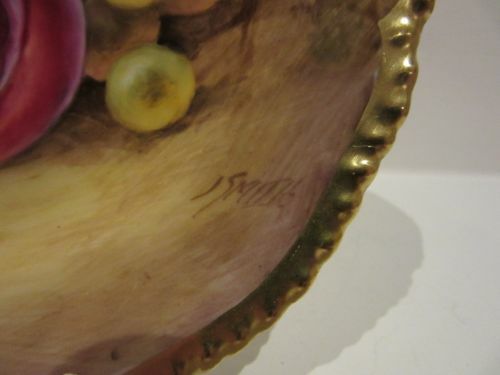 Measuring approximately 4.1/2"diameter x 2.3/4"high, it has the black factory stamp for circa 1970 and is in excellent condition with no damage, crazing or restoration and the gilding is bright and shows virtually no wear. 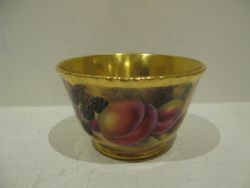 A Royal Worcester Fruit Painted Sugar Bowl By Ricketts. 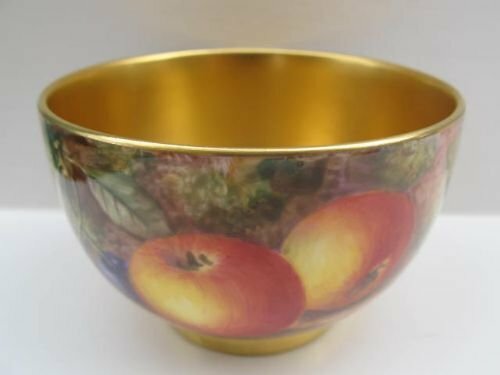 A Royal Worcester porcelain sugar bowl with very well painted fruit decoration by the unmistakable hand of William Ricketts. 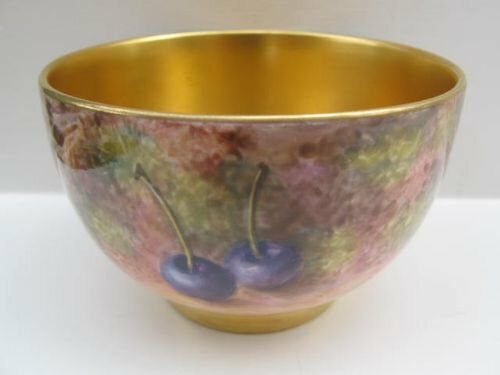 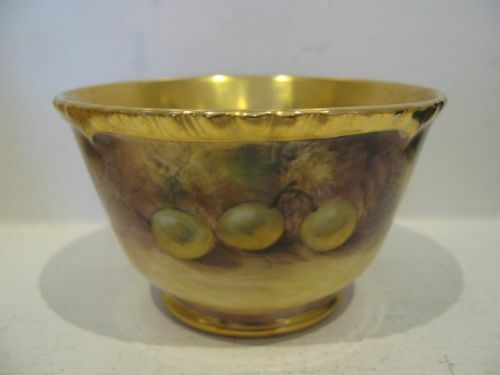 Standing approximately 3.5/8"diameter x 2.1/8"high, it has the puce factory stamp for 1919 and is in very good condition with no damage, crazing or restoration, and the gilding showing just the usual signs of use in the bowl. 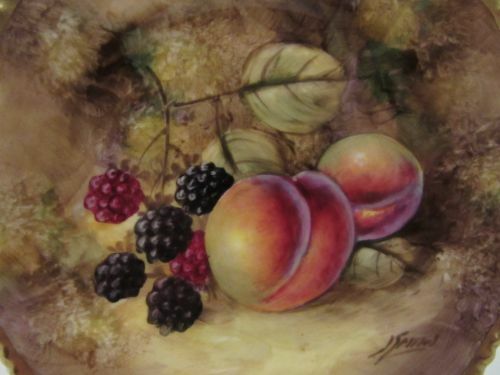 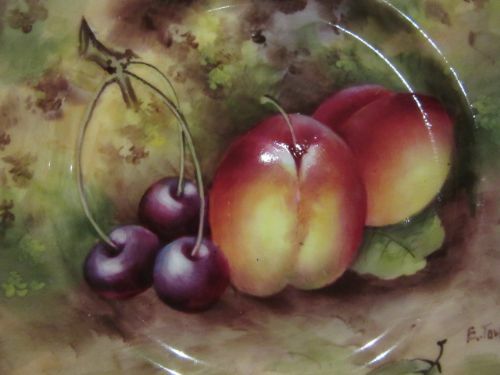 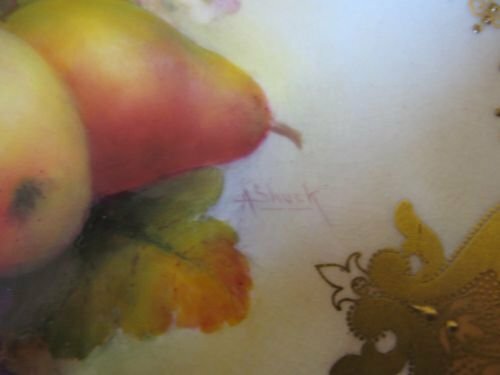 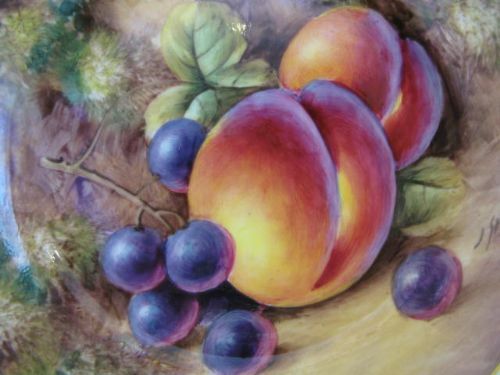 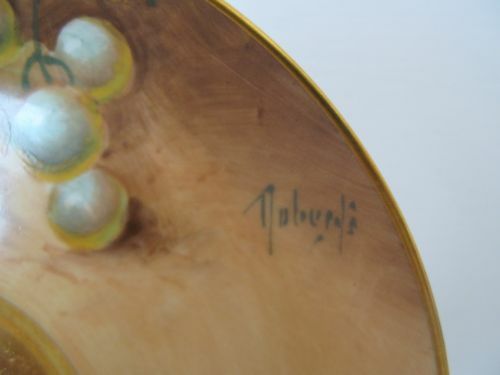 A Royal Worcester Fruit Painted Tazza By Albert Shuck. 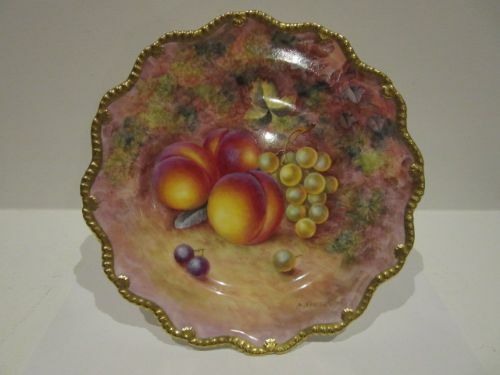 A very attractive, Royal Worcester porcelain tazza with superbly gilded border and well painted fruit decoration by Albert Shuck. 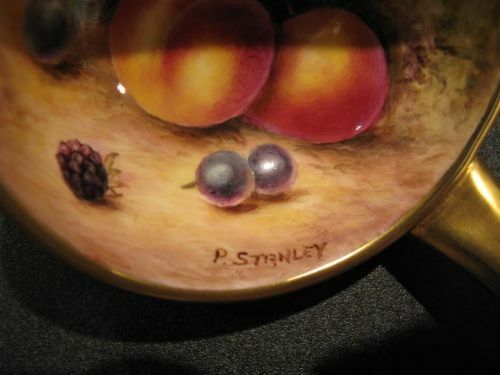 It is of impressive size with approximate overall dimensions of 12.3/4" long x 9.3/4"wide x 6.1/4"high, puce factory stamp for 1925, and apart from some glaze cracking to the central fruit painted panel near to the siognature, it has no damage, scratches or restoration, and the gilding shows virtually no signs of wear or rubbing. 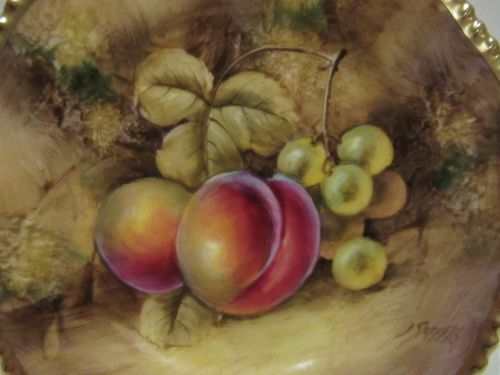 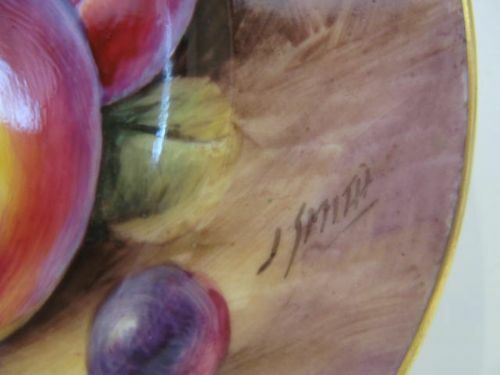 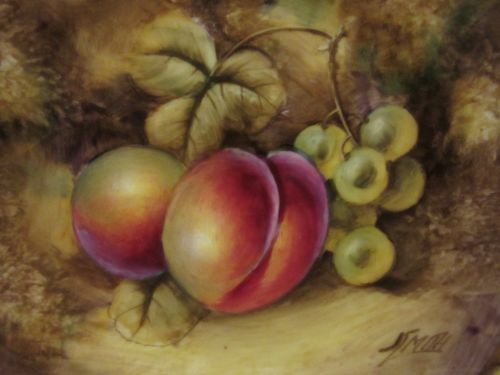 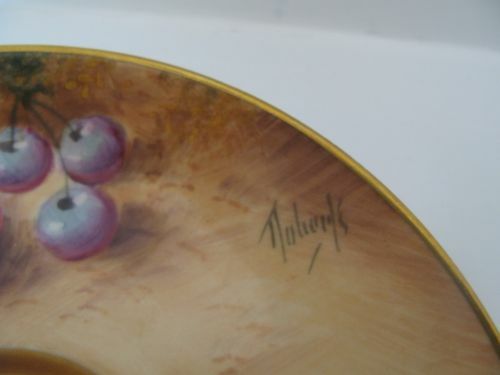 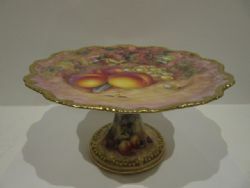 A Royal Worcester Fruit Painted Tazza By H. Ayrton. 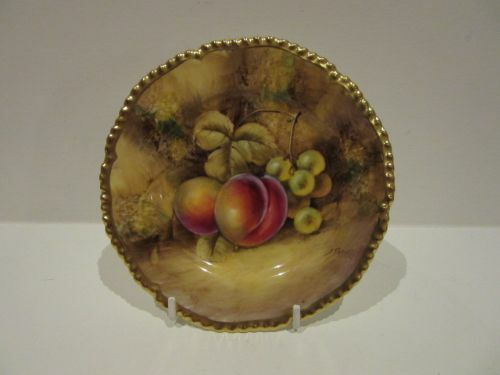 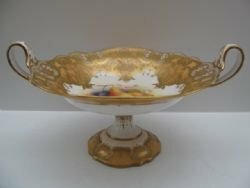 A lovely Royal Worcester porcelain tazza/comport, with shaped and heavily gilded gadrooned rim, and very well painted fruit decoration by Harry Ayrton. 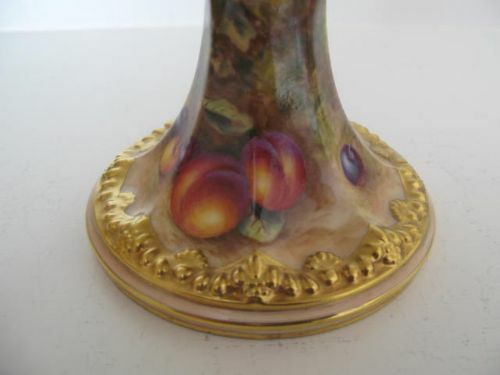 Measuring approximately 8.3/4"diameter x 5"height, it has the black factory stamp for circa 1970 and is in excellent condition with no damage, crazing or restoration and the gilding is fresh and bright. 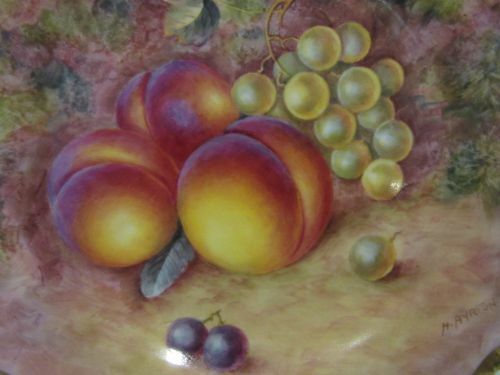 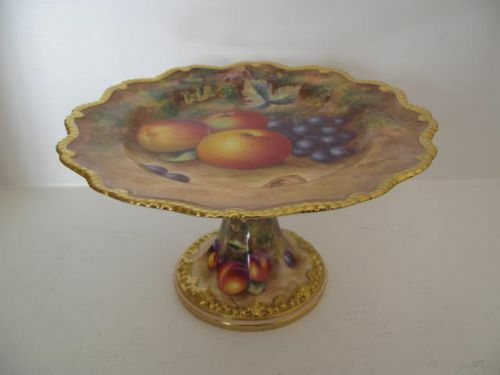 A Royal Worcester Fruit Painted Tazza/Comport By H Ayrton. 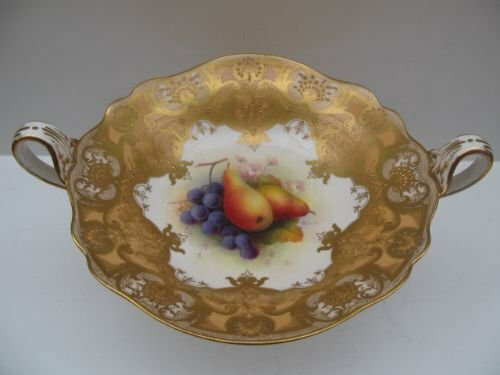 A very attractive Royal Worcester "star" shape porcelain tazza/comport, with well painted fruit decoration by Harry Ayrton. 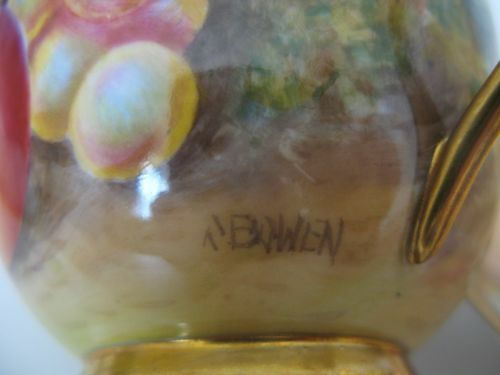 It stands approximately 8.3/4"diameter x 5"high with the black factory stamp for circa 1965-1970, and is in excellent condition with no damage, crazing or restoration and the gilding is bright and without wear. 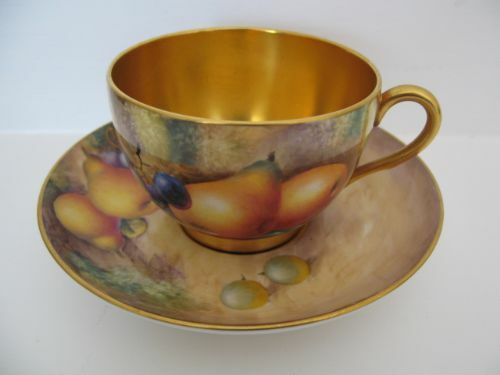 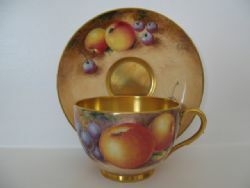 A Royal Worcester Fruit Painted Teacup And Saucer. 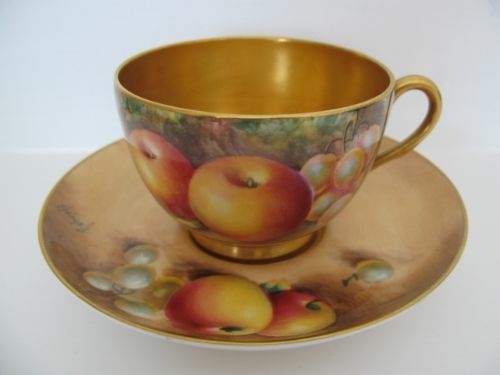 A Royal Worcester porcelain teacup and saucer with well painted apple and green grape decoration. 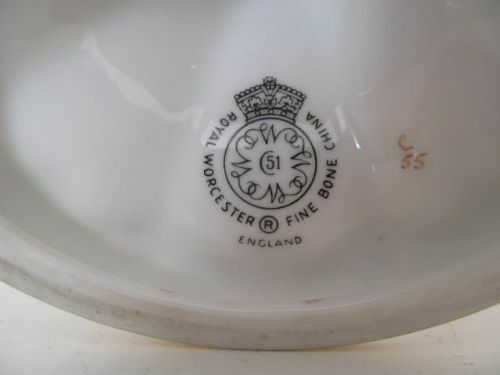 The teacup measures approximately 3.1/4"diameter excluding the handle and is painted by Christopher Bowen, the saucer is 5.5/8"diameter and painted by William Roberts. 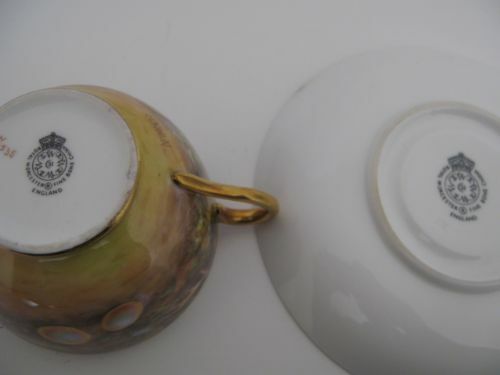 Both pieces carry the black factory stamp for circa 1965-1970 and are in very good condition with no damage, crazing or restoration, and apart from the usual slight wear in the well of the saucer and interior of the cup, the gilding is in good condition. 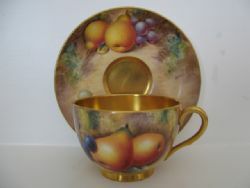 A Royal Worcester porcelain teacup and saucer, with well painted decoration of pears and black and green grapes. 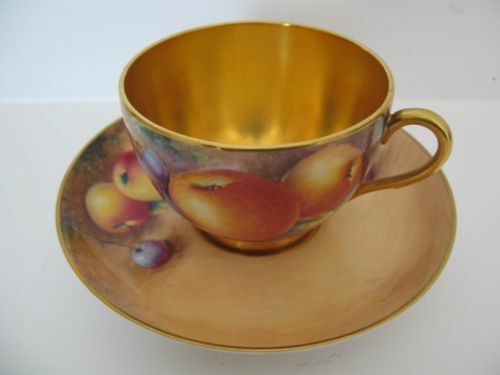 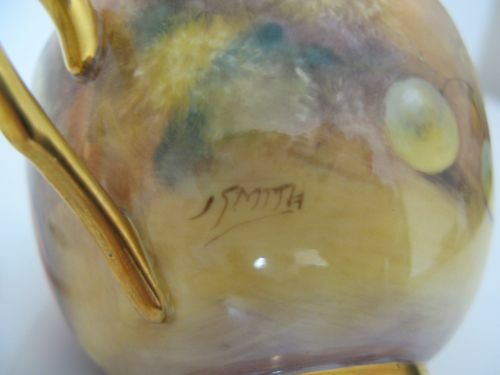 The cup measures approximately 3.1/4"diameter excluding the handle and is painted by John Smith, the saucer is 5.1/2"diameter and painted by Alan Telford. 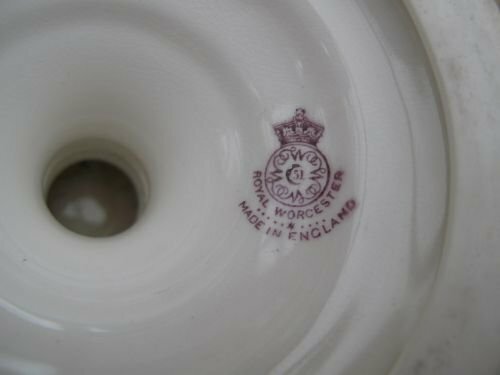 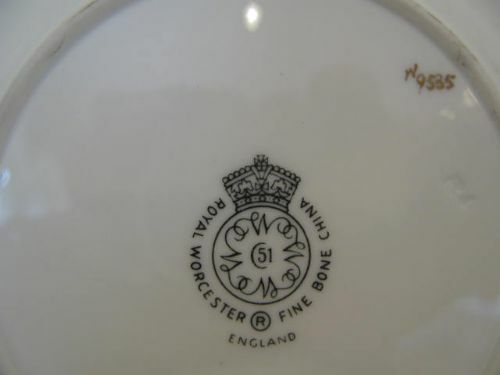 Both have the black factory stamp for circa 1965-1970, and apart from a little light wear to the gilding in the well of the saucer, are in excellent condition with no damage, crazing or restoration. 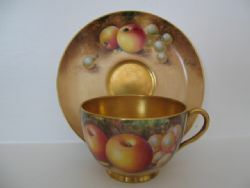 A Royal Worcester porcelain teacup and saucer, with well painted decoration of apples, grapes and cherries. 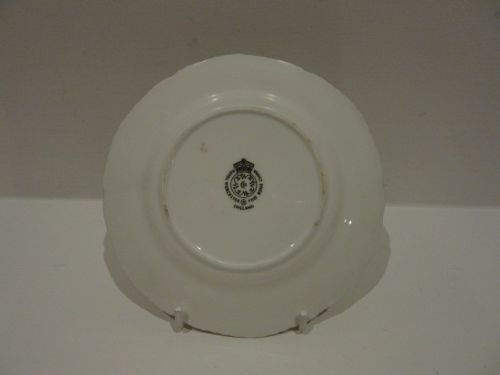 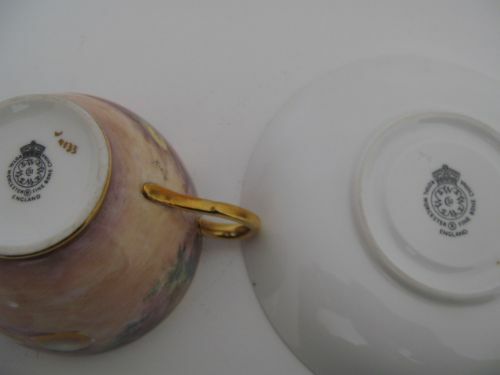 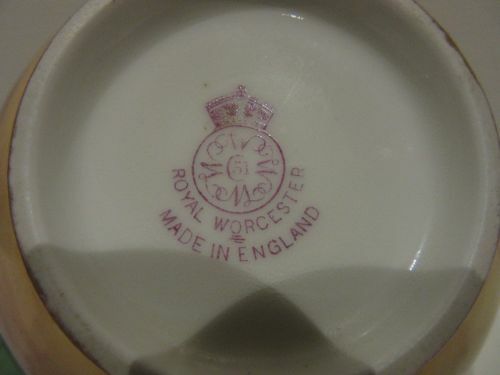 The cup measures approximately 3.1/4"diameter excluding the handle and was painted by Richard Lewis, the saucer measures 5.1/2"diameter and was painted by William Roberts. 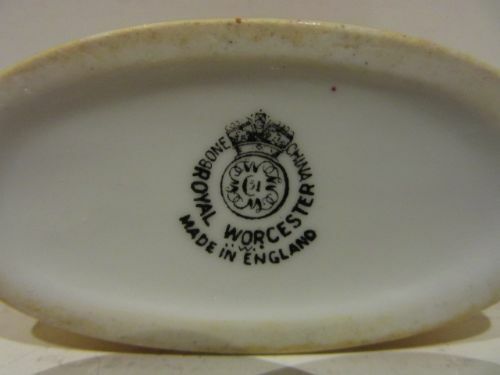 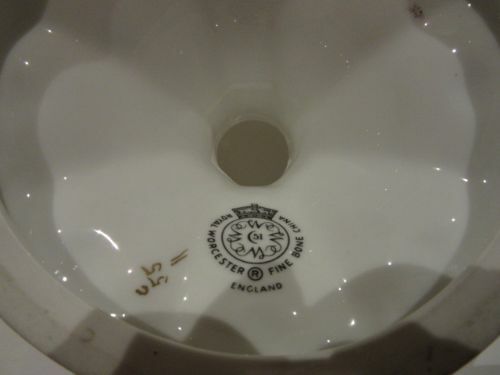 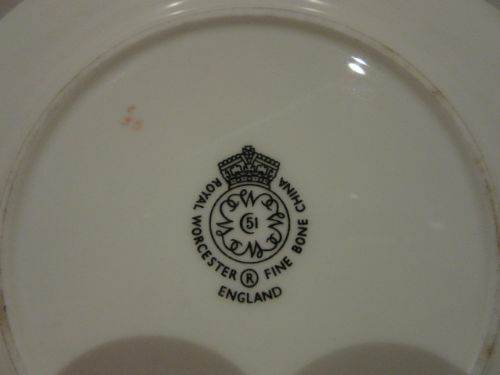 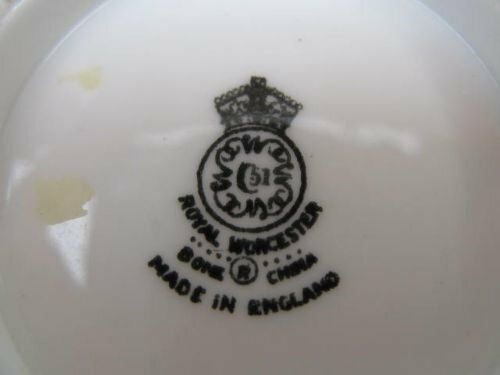 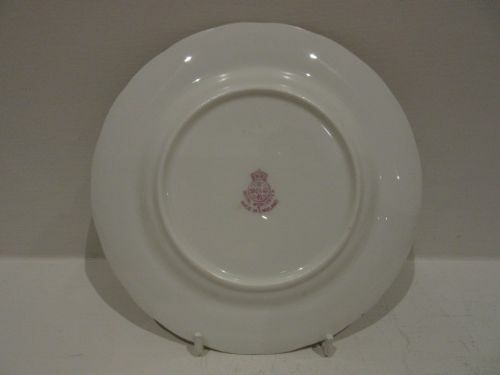 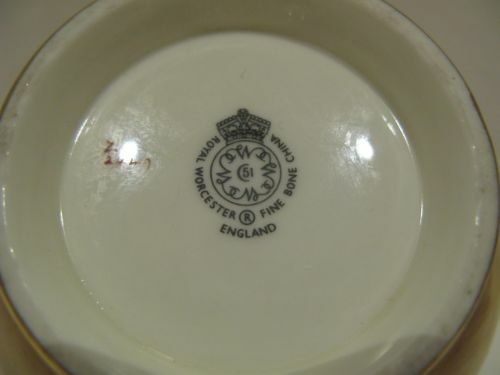 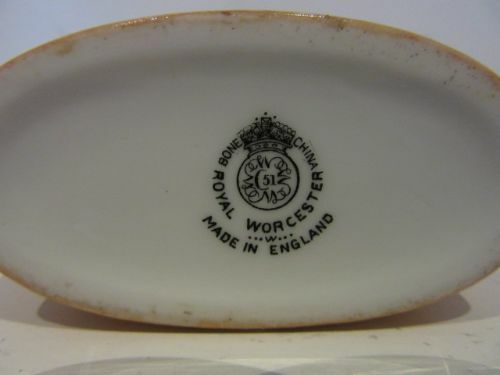 Both have the black factory stamp for circa 1965-1970, and apart from a few slight signs of wear to the gilding in the well of the saucer, are in very good condition with no damage, crazing or restoration. 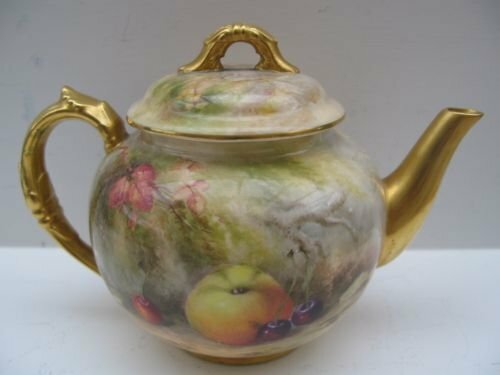 A Royal Worcester Fruit Painted Teapot By William Ricketts. 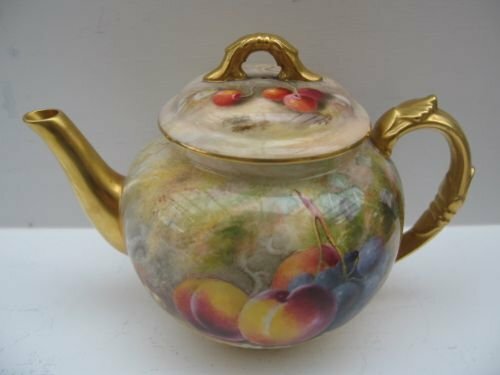 A Royal Worcester porcelain teapot with well painted fruit decoration by William Ricketts. 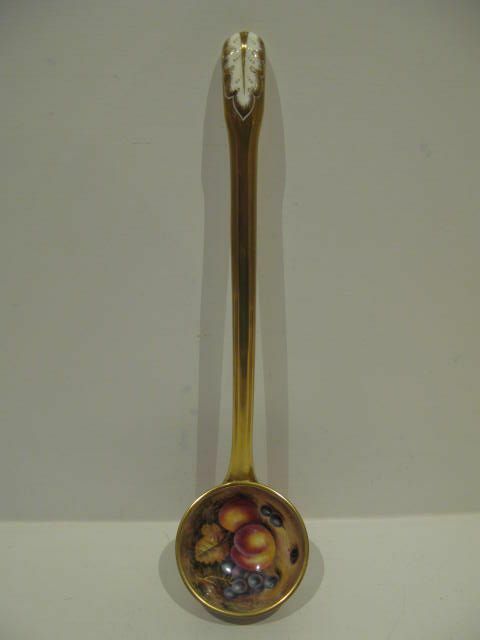 Standing approximately 5"overall height x 7"long from handle to tip of spout, it has the puce factory stamp for 1919 and is in very good condition with no damage or restoration, and the gilding shows very few signs of its 93 years of age. 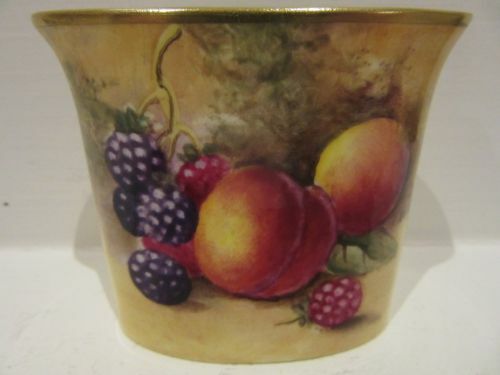 A Royal Worcester Fruit Painted Toothpick Or Matchstick Holder By N. Wild. 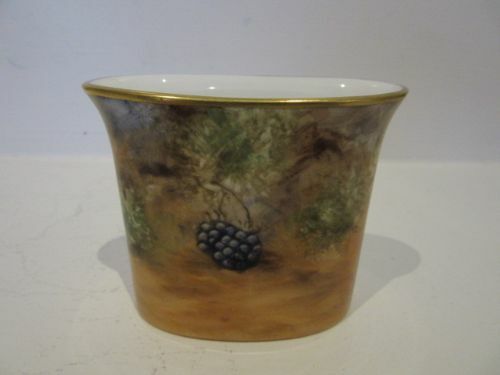 A Royal Worcester porcelain toothpick or matchstick holder, decorated with well painted plums and brambles against a mossy background by Nigel Wild. 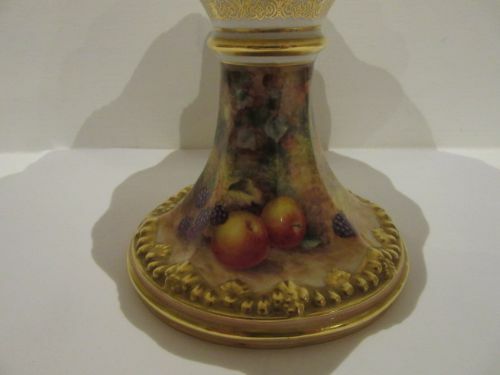 Standing approximately 2.1/2"tall x 2.7/8"wide x 1.1/8"deep, it has the black factory stamp for 1954 and is in excellent condition with no damage, crazing or restoration and the gilding is bright and virtually without wear. 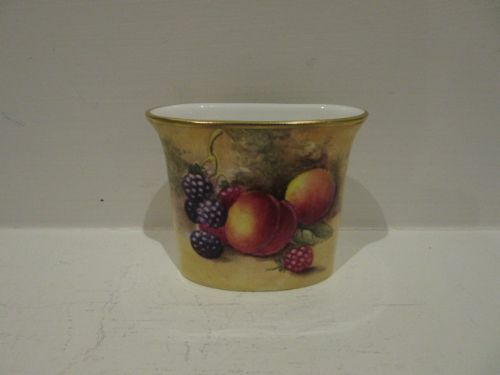 A Royal Worcester Fruit Painted Toothpick Or Matchstick Holder. 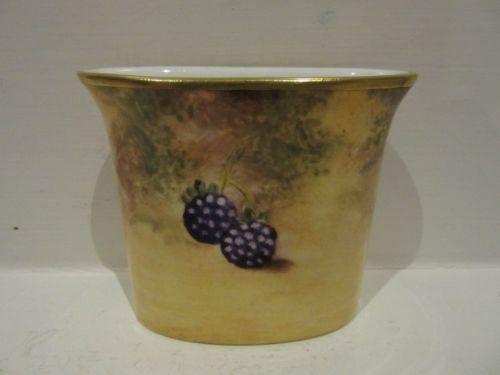 A small Royal Worcester porcelain toothpick or matchstick holder, with well painted green grape, plum and bramble decoration by John Smith. 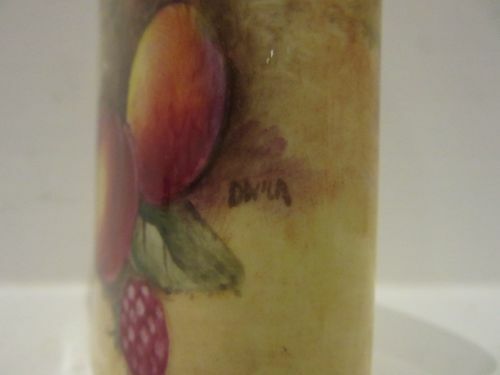 Measuring approximately 2.1/2"tall x 2.7/8"long x 1.1/8"deep, it has the black factory stamp for 1956 and is in very good condition with no damage, crazing or restoration and the gilding is bright and virtually without wear.